Dakini are described as women who fly, she who moves in space...sky dancers. The name originally came from the Tibetan word ''Khandro''. Dakinis are said to be the embodiment of Intuition. The space they fly through is the Shunyata..the Void from which all emerges. the Void of Plenum. Dakinis are Void walkers. Though often depicted as wrathful, this is simply because Dakini wisdom is direct, radical, courageous and sharp. Though represented in the female form they are the quintessential representation of non-dualism in Vajrayana yoga, and so are beyond gender. Dakini is a complex subject, representing infinite and subtle cosmic wisdom, but also used on a personal level as a visualised aspect of Buddhahood, or awakening. She is a Messenger of Wisdom. ''The dakini releases blockages in the energy field and melts frozen patterns, so that the door of the mind is suddenly ajar and something new can enter. Dakinis are often connected to the phenomena of synchronicity and inexplicable coincidences of fate. Tsultrim Allione wrote in her book, Women of Wisdom, "The dakini appears at crucial moments. These encounters often have a quality of sharp, incisive challenge to the fixed conceptions of the practitioner." The concepts of Soul Flight and Bird Goddesses is very ancient. Yeshe Tsogyal who, along with her consort Padmasambhava, originated Tibetan Buddhism, is considered an emanation of Vajrayogini. There is an archaeological theory about the exchange between East and West along the Silk Road for thousands of years and of shamans migrating both directions. There are ancient Caucasoid burials in Cherchen in Northern China which hold tall, blond-haired, blue-eyed people in shamanic garb. Yeshe Tsogyal is said to have been born in Cherchen, perhaps then a trained lineage -holder from the cross-over shamanic traditions of East and West. 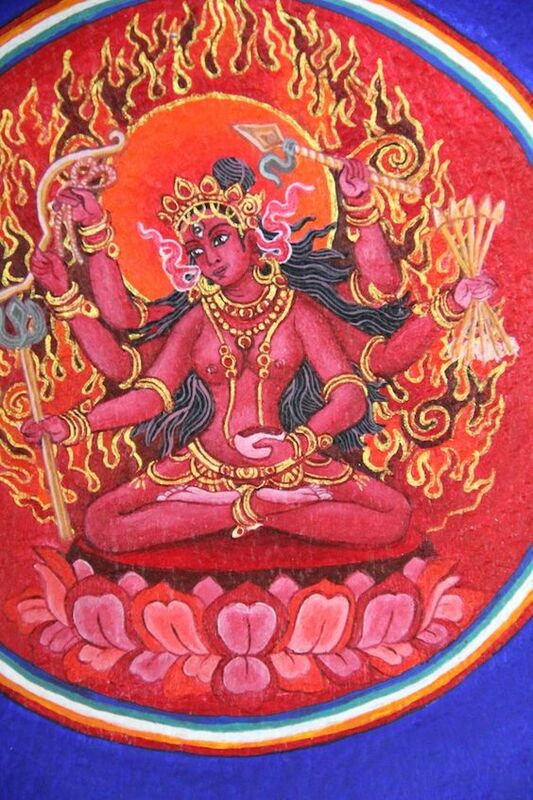 Note: the representations of Vajrayogini show her drinking blood, which is her own menstrual blood. You can look this up, the symbolism of it etc. It is the red bodhichitta of the Great Mother, that which connects all beings through the chain of birth. It is alternatively called The Elixir of Life. She also carries a chopper or knife which is used to cut away at ego and anything that is not essential. Practice of Vajrayogini sadhana is said to be the quickest method in degenerate times. You can check out material on Anuttara Yoga. In my opinion Vajrayogini and Red Dakini are similar archetypes to Prana Shakti from the tantric practice of tattwa Shuddhi, and to Durga. I see them as symbolically similar. The energy is the same. (In my opinion for what it's worth). Here is a couple of pictures of Prana Shakti. You need to be a member of somathread to add comments! Glad you brought me back to this post, so I could fix the broken image links. And it's always nice to be reminded of dakinis. If we look into the Red Maiden, she is a personification of the fire snake or serpent power in us. The image of the Red Maiden dancing in our belly is the generation of the inner heat, inner purification, and a great manifesting power. The image of the Red Maiden dancing in our heart is the uplifting of the serpent power to the heart star, and the sending out of this power in love and compassion, the generation of the Sacred Heart. The image of the Red Maiden dancing in her light palace on top of our head, this is the serpent power uplifted to the brow star and crown, and the full generation of the light body. When we enter into union with the Red Maiden, and we dance in the Mother, so this becomes a raying out of blessings from our light body and interior stars, energetic prayers for the happiness of all beings, and an offering of ourselves, all our energy and life, to God the Mother; it is an offering in Great Joy! I have been making a lot of connections recently with Red and White..even got this lovely card today..Heart Drop which is a combination of red and white heart in front of a stupa. Wisdom and Compassion. Yesterday when I was holding the red and white image I thought of course of pink and then a few hours later driving home the full moon rose above the most incredible and huge stack of bright pink, lenticular clouds. It was surreal looking, like God was having a joke it was so spectacular. It was so beautiful i could hardly believe my eyes. Me too re red colour. Only recently have been aware how much of it was subconscious...only red and white candles on my altar, drew a pic years ago of kids in ''egg form'' and they are one red, one white, one pink, and so on. I have been wearing a thin red scarf around my middle for a few months. (different ones...I do wash!) You can use a thread too..... red embroidery thread. It is a way for daily reminder. I love that picture Noctua of the red girl. the Rainbow Body attainments of the Vajra Guru and Vajra Dakini, for example, are a direct expression of the mystery of what we call the Great Resurrection and Ascension. Such is the true nature of power, energy, it is neither good nor evil in and of itself, but it becomes good and evil, and everything in between – it is all a question of how power is used and manifest. In this sense, the serpent is as the Force in the modern mythology of “Star Wars,” having a Light Side and Dark Side, flowing through everyone and everything, and manifesting as everyone and everything. In the East this Force is called Shakti and Dakini, and in our tradition it corresponds with the Holy Shekinah and Holy Spirit manifest in creatures and creation, in heaven and on earth; most specifically, this Force is the Serpent Power, Fire Snake, or Fiery Intelligence, or what in the East is called “Kundalini Energy” – an evolutionary force or divine power in all things. She is akin to the principle of Shakti in Hinduism, or Dakini in Buddhism, this Holy Spirit, the Holy Shekinah – Great Goddess.